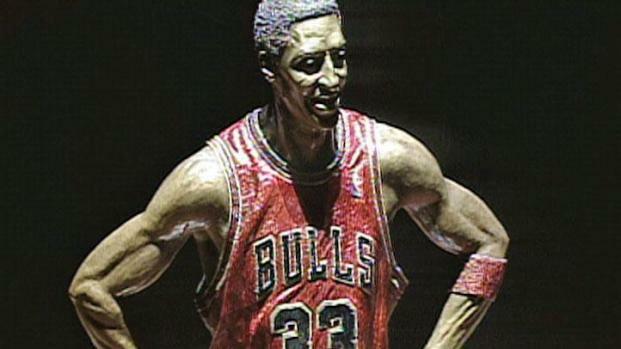 Scottie Pippen now has a sculpture at the United Center, just like Mike. The Bulls unveiled the bronze bust showing him in his No. 33 jersey during a ceremony at halftime of Thursday's game against the Boston Celtics at the United Center. It was a fitting honor for the Hall of Famer, who along with Michael Jordan led the Bulls to six NBA championships in the 1990s. Pippen told the crowd he was "truly honored" and thanked the organization and fans, saying he appreciated "the love, the drive" they gave him. The Bulls unveiled a bronze bust Scottie Pippen in his No. 33 jersey during a ceremony at halftime of Thursday's game against the Boston Celtics at the United Center. The statue, which will be displayed in the arena concourse, was made by the same artist who sculpted Jordan's outside the United Center. Pippen says this "truly ranks at the top" of all the honors he's received.